Overview: Swinging across the city and across the pond, Spider-Man is back in action with amazing adventures and spectacular scenes. This is Essential Web of Spider-Man Vol. 2! The stories in this collection fall at either end of the scale – these are either really good or really bad. Focusing on the good tales, Peter and Joy Mercado travel to the United Kingdom, where Spider-Man must rescue Margaret Thatcher from an assassination attempt. We don’t get many political or real-world scenario stories with Spidey (generally), so these issues stand out as a change of pace. We also get the typical New York mob story as we get the origin story of the Rose, who is the estranged son of the Kingpin. In addition, we get a wrap-up to the Ned Leeds/Hobgoblin arc that had been building for years across the various Spider-Man titles. The volume concludes with one of the most powerful Spider-Man stories of all time, Kraven’s Last Hunt, which ran across the three monthly books for two months. Kraven takes out Spider-Man and dons his costume to replace him. Kraven buries Peter in a shallow grave. Meanwhile, Vermin is back, kidnapping people into the sewers to feast on them, and his most recent victim is Mary Jane. The storylines all converge together, and Peter must reclaim his title as Spider-Man, leaving Kraven a shattered shell of his former self. This magnificent story from J. M. Dematteis and Mike Zeck remains as one of the greatest arcs of all time. So, yes, the reason to own this collection is for Kraven’s Last Hunt. This is one of the most powerful Spider-Man stories of all time. This still stands up nearly 25 years later, and it should be part of any collection. The fact that we get other Spider-Man stories is an added bonus – sort of! The stories from David Michelinie and James Owsley (Christopher Priest) are solid stories. The fill-in issues that round up this volume feel so out of place when lined up against these other tales. This might be a volume where you check the issue credits before reading the issue. If you like this volume, try: finding two books that were never reprinted in the Essential format, but would be helpful to have read when reading this volume. The first is Amazing Spider-Man Annual #21 (1987), which features the wedding of Peter Parker and Mary Jane Watson. This was a landmark issue years in the making, as the two lovebirds finally tied the knot. 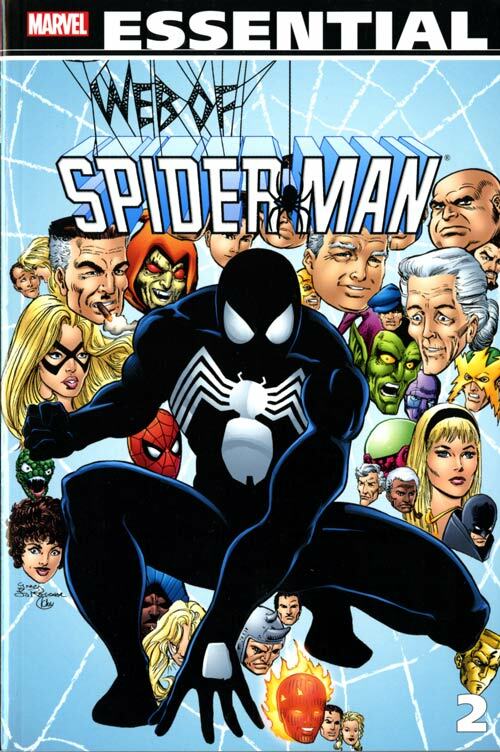 The issue featured two different covers – the first had MJ and Peter, with their friends and family in the background, while the second had MJ and Spider-Man, with his enemies in the background. MJ’s dress was actually designed by real-life wedding dress designer Willie Smith. Marvel actually made it into a real event, hosting a ceremony at Shea Stadium. This has been reprinted in multiple trades including the Marvel Weddings TPB. The second is Spider-Man vs. Wolverine #1 (February 1987). This was a stand-alone special edition book that gave us the identity of Hobgoblin, a mystery that had been building for four years in the various Spider-books. Turns out that it was [SPOLIER ALERT FROM 30 YEARS AGO!] mild-mannered reporter Ned Leeds who had been tormenting Spider-Man and trying to take over the crime rackets in New York City. We get a follow-up issue of Web of Spider-Man to this special edition – too bad it wasn’t included in this collection. Overview: Get your motor runnin’ as Ghost Rider races to the finish line of his first series. This Essential collection brings the 1970s series to an end, perhaps with some of the best issues of the entire run. This is an interesting take on the character, as I think the book finally gets the right creative team and directions for the comic. Rather than treating the book as a reluctant hero, it becomes more of a horror title, focusing on a title character struggling to keep a demon in check. It’s too bad that the direction came so late because there was no way to avoid the dreaded cancellation ax by this point. I almost wish Dematteis & Budiansky had more issues to play with this concept. Despite the cancellation of the title, we do get two epilogs of sorts to Johnny Blaze and to the demon Zarathos. Johnny Blaze gets to bid farewell to many of his former Champions teammates over in the pages of New Defenders, while Zarathos is used as a pawn by the Beyonder to test the limits of Peter Parker in Amazing Spider-Man. What makes this Essential? : The good news is that this is the final Essential volume for this character. I’m running out of ways to be diplomatic with my comments. Nonetheless, I like the way that writer J.M. Dematteis and artist Bob Budiansky brought the whole series to a conclusion, picking up many of the plot threads and characters introduced years earlier. Given the way so many other titles abruptly ended in this era (I’m looking at you, Spider-Woman! ), this was a nice way to say so long (for now) to Johnny Blaze. If you like this volume, try: the Ghost Rider by Jason Aaron omnibus from Marvel. 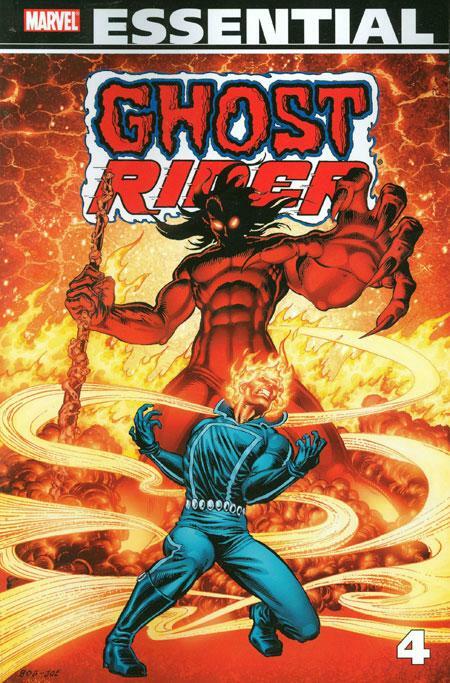 Released in 2010, this collects writer Jason Aaron’s run with the Ghost Riders (Johnny Blaze and Danny Ketch), with art by the likes of Tony Moore and Tan Eng Huat. My issues with Ghost Rider is not that I don’t like the character. The 80+ issues that I have read over the four Essential volumes are just not that great. Whether the stories do not hold up over the years or that the stories are just really bad can be debated. There have been some writers on this run who I really like, but I don’t know that their Ghost Rider work is the best example of their abilities. So, with all of that said, I truly believe that Jason Aaron is one of the best writers at Marvel today. His volume of work stands out across multiple titles and genres. I think you could find the most obscure Marvel character, and Aaron could find a take on the character that will blow everyone away. Please check out his current work (Mighty Thor, Doctor Strange) and track down the Ghost Rider omnibus. 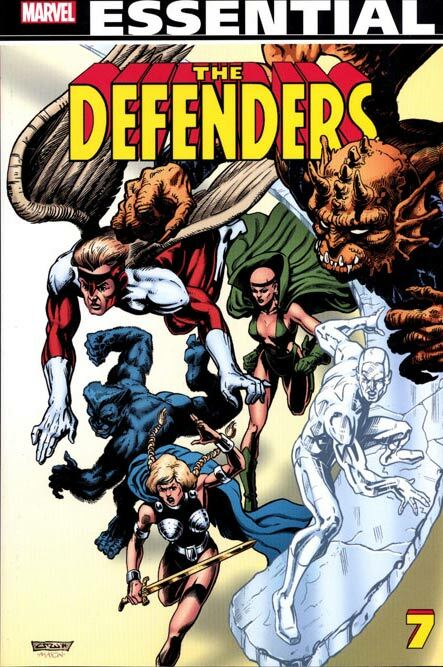 Overview: Welcome back to yet another volume of Essential Defenders. For a book with no official line-up, headquarters, and/or uniforms, it still amazes me that this title ran for 152 issues. It was a title that for 15 years could do almost any type of story, as everything was fair game with magicians, mutants, Asgardians, and more hanging out each and every month. This volume kicks off with the death of Valkyrie, or so it seems. See back in Defenders #66 to #68, Valkyrie’s spirit was put into the body of Barbara Norris, and Norris’ spirit was placed into Valkyrie’s body, who was left in the Asgardian realm of Niffleheim. 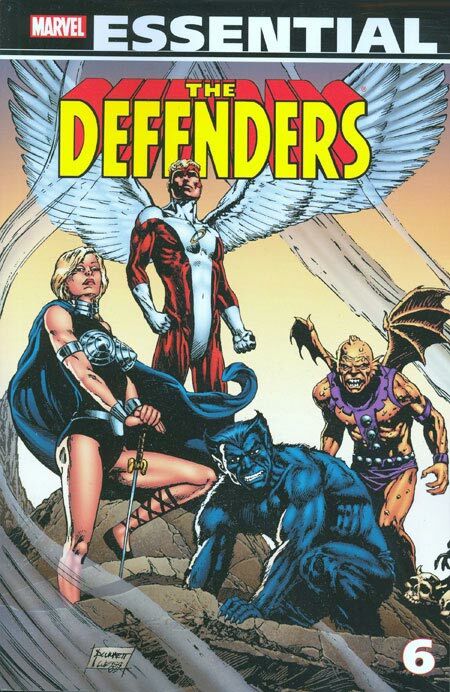 While Norris’ body is killed, the Defenders are able to save Valkyrie’s spirit, and reunite it with her body. So, long live Valkyrie, and so long Barbara Norris. Next up is Avengers Annual #11, which won’t be found in the Essential Avengers run. Long-time Defenders adversary Nebulon finds himself sentenced to Earth. He encounters Thor, who brings Nebulon to the Avengers to aid the alien in returning to his home. At this same time, another member of Nebulon’s race, Nalia, arrives and seeks out the Defenders. She claims that Nebulon has plans to take over the Earth, and asks the Defenders to stop him. In typical comic book fashion, the two teams square off in the Himalayas, only to eventually realize that both teams were being manipulated by the aliens. As this volume winds down, we see the transition start with the line-up that leads to the creation of the New Defenders. The Beast becomes more of the de facto leader of the non-team. Two of the Beast’s former teammates, Iceman and the Angel, show up and stick around. Valkyrie brings along a guest in Moondragon, who is under the warrior’s supervision following her latest power grab move with the Avengers. And of course, there is the Gargoyle, who really has no place else to go, so of course, he will stick around. Patsy Walker and Daimon Hellstorm finally take their leave of the team following their wedding. 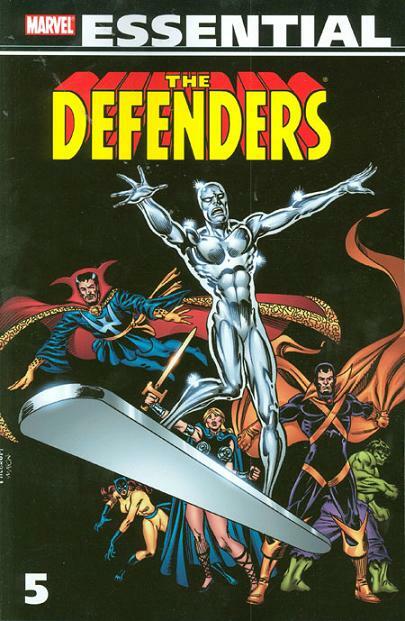 And the four heroes most closely associated with the concept of the Defenders – Doctor Strange, Hulk, Sub-Mariner, and Silver Surfer – turn over the reigns to the new team, knowing that there is a new set of Defenders to help protect the world. What makes this Essential? : There are parts of this book that are good to read, such as the Avengers Annual, the Squadron Supreme crossover, and the formation of the “New Defenders”. However, I don’t know that the sum of these parts justifies the full Essential volume. These are decent stories, but so much of this run just feels like a monthly placeholder, just to ensure that the book met its monthly deadline. If you like this volume, try: The Vision and Scarlet Witch mini-series from 1982. Following yet another roster shuffle in Avengers #211, the Vision and the Scarlet Witch opted to become reserve members and move out to a home in New Jersey. Despite some occasional appearances in The Defenders and the team-up books, the Vision and Scarlet Witch were out of the spotlight for awhile before earning their first mini-series, created by Bill Mantlo and Rick Leonardi. These two characters have such a complex family history, which all comes into play in this series. The Vision is visited by the Grim Reaper, who is the step-brother to Wonder Man, who shares his brain patterns with the aforementioned Vision. We get a visit by the Golden-Age hero, the Whizzer, who was once thought to be the father to the Scarlet Witch and Quicksilver, but that was finally proven not to be true in this series. But the significant news that came out of this mini-series was the true heritage of Wanda and Pietro – as the children of Magneto. (It had long been assumed, finally confirmed, and recently overturned in order to support the Marvel Cinematic Universe.) This series was reprinted in a 2005 trade paperback, but I believe the actual issues can still be tracked down in the back issue bins. Overview: This may be a short review this week, so my apologies in advance. But I’m finding it a challenge to create an overview for this collection. As we saw in the second half of the previous volume, the Hulk! magazine featured longer length stories that were not necessarily tied into continuity with the monthly comic. Perhaps borrowing an approach from the 1970s TV series, a lot of the stories feature Banner coming into a random town, getting caught up in some evil plot, and then letting the Hulk take over and smash everything to pieces. We get a few stories that are inspired by real events. For example, in Hulk! #20, the Hulk is needed to stop a nuclear meltdown a la Three Mile Island. A lot of the stories deal with issues of that time (drug use, land rights, which still remain relevant 35 years later. For me, the highlight of this book was the final story in the collection, and not because it was the last. Written by J.M. DeMatteis with art by Gene Colan, we have the Hulk wandering into Las Vegas. The down-on-his-luck Banner is befriended by a chorus dancer and a past-his-prime lounge singer, but they all end up getting on the bad side of the casino bosses. That very well could have been a story made for the television show, but it was better produced in comic book form. What makes this Essential? : I hate it when I come to this conclusion, but I can’t say that this book is essential. The stories are average – nothing that stands out or gets revisited later. There is some great art from Gene Colan and Ron Wilson, but I don’t know that it’s enough to warrant buying the book. Outside of one or two mentions to Betty Ross or General Thunderbolt, you really don’t know that this is part of the Marvel Universe. These stories could be told with any character that transforms into a monster of some kind. For the Hulk completist, I could justify picking this up versus undergoing the hunt to track down the original magazines. For the average fan, I don’t know that the return would justify the investment (time and money). If you like this volume, try: the Peter David run on The Incredible Hulk. David has been linked with the Hulk since 1987, when he started a 11-year run on the title. Over that time, he told stories featuring the various versions of the Hulk – mindless brute or Banner-controlled, as well as green or gray. David was one of the first writers to turn Rick Jones into a Hulk, hinting at the role he would one day play as A-Bomb. For me, my favorite Hulk run came in the late 1980s with Mr. Fixit. At this time, Hulk was in his gray form with moderate intelligence. He could only come out at night, harkening back to the original story elements of the Hulk from Lee & Kirby. Mr. Fixit set himself up as a heavyweight enforcer in Las Vegas, a city known for living large in every way possible. 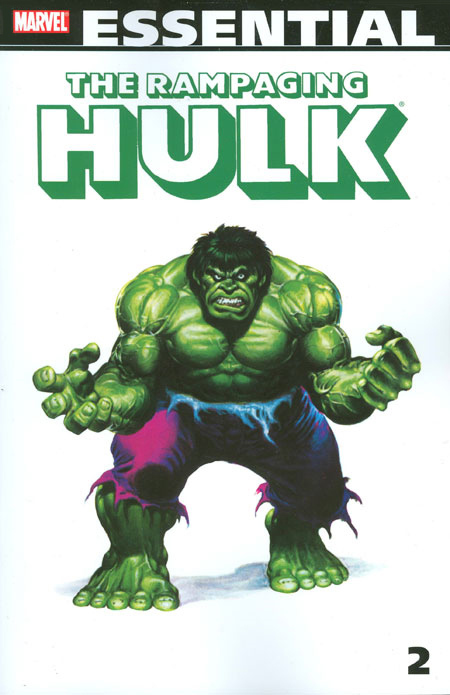 David’s run has been collected in a series of Hulk Visionaries volumes. If you want to read the Mr. Fixit story, you are going to need to pick up Volumes 2-4 of that line.